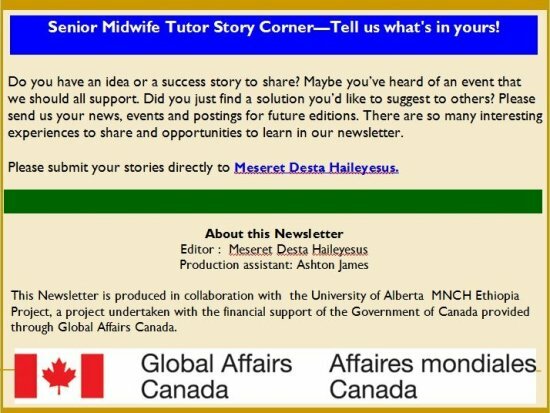 To receive email from Ashton James, add ETMNCH@ualberta.ca to your safe sender list. Our regular newsletters are an easy way to keep up-to-date with all new developments and interesting scientific research in the field. We keep you informed of all our upcoming events and activities so you never miss out. If you have any comments about this or any other issues, or are interested in contributing content to our upcoming issues, please feel free to contact us at etmnch@ualberta.ca or to contact our Editor, Meseret Desta Haileyesus, at mesidesta@gmail.com. On May 26th, the project graduated the 4th cohort of the Senior Midwife Tutor Training Program (SMTTP). 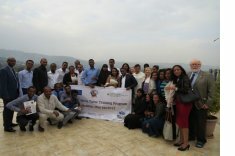 For three weeks in May, 30 SMTTP participants gathered in Addis for the final Teaching & Learning component, after spending the previous two months in their home communities practicing the clinical skills learned and conducting community-based assessments. While in Addis, participants completed the Helping Mother Survive-Bleeding After Birth (HMS-BAB) and Essential Care for Every Baby/Essential Care for Small Babies (ECEB/ECSB) training modules. This year was the first year the project offered ECEB/ECSB training, and to-date has trained 90 healthcare professionals through the SMTTP and training sessions in Fiche. ECEB teaches essential newborn practices to keep all babies healthy from the time of birth to discharge from the facility. ECSB teaches special care needed for small and premature babies born in low-resources areas. Participants learn how to keep them warm using skin-to-skin wrapping and how to keep them nourished using alternative feeding methods. The May component of the SMTTP also included a 3.5 day Quality Improvement (QI) workshop to teach participants to identify problems, and design and implement interventions using a 10-step process. At the end of this workshop, participants designed their own QI projects to be implemented in their home institutions. The progress of these interventions will be shared with other graduates during the Continuing Education Symposium in November. Over the past two months, project staff have been visiting SMTTP graduates at their home institutions to provide further mentorship on the teaching and clinical skills learned throughout the SMTTP. 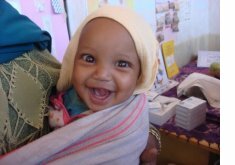 During a workshop in July 2017, UNICEF announced recent results stating that Ethiopia has reduced the rate of child malnutrition for children aged 6 to 23 months by 20 percent in sixteen years. The results, dropping from 58 percent in 2000 to 38 percent in 2016, represent significant progress in the fight against malnutrition for the nation. Dr. Ephrem Tekle, Director of Maternal and Child Health at the Ministry of Health, said the period from 6-8 months when children transit from exclusive breastfeeding to crop-based complimentary feeding are critical. “As these periods are crucial for the health growth of children, the government has been engaged in community mobilization works through health and agriculture extension programs to reduce child malnutrition,” Tekle said. Even though the country has attained results in feeding practices and complimentary foods for children 6-23 months, progress has so far been slow, the Director stressed. According to a study conducted by UNICEF, an estimated 5.7 million children are stunted in Ethiopia due to the combined effects of poor malnutrition, repeated infection and inadequate psychosocial stimulation. Newborn health plays an increasingly important role in the Sustainable Development Goal period. The day of birth and the first 28 days of life are the most vulnerable time for a child’s survival and health. Newborn deaths account for 45 percent of under-five deaths globally, up from 40 percent in 1990. The Every Newborn Action Plan is a road map of strategic actions that harness evidence-based solutions to end preventable newborn mortality and stillbirths, and contribute to reducing maternal mortality and morbidity. The plan identifies eight specific milestones that guide immediate actions needed by 2020 to best impact the ambitions of the SDGs. The “Reaching the Every Newborn national 2020 milestones” report details leadership and actions by countries around the world that are taking forward the goals and recommendations set out in the Every Newborn Action Plan. In 2016, 51 countries completed the Every Newborn Tracking Tool. The report presents the findings of the progress tracking tool, spotlights activities in a range of countries and exemplifies some of the partner efforts to support country progress. A high-fat diet not only creates health problems for expectant mothers, but new research in an animal model suggests it alters the development of the brain and endocrine system of their offspring and has a long-term impact on offspring behavior. The new study links an unhealthy diet during pregnancy to mental health disorders such as anxiety and depression in children. The study tested the effect of a maternal high-fat diet on Japanese macaques, tightly controlling their diet in a way that would be impossible in a human population. They measured and compared anxiety-like behavior in 135 offspring and found that both males and females exposed to a high-fat diet during pregnancy exhibited greater incidence of anxiety compared with those in the control group. The scientists also examined physiological differences between the two groups, finding that exposure to a high-fat diet during gestation and early in development impaired the development of neurons containing serotonin, a neurotransmitter that’s critical in developing brains. “Given the high level of dietary fat consumption and maternal obesity in developed nations, these findings have important implications for the mental health of future generations,” the researchers report. 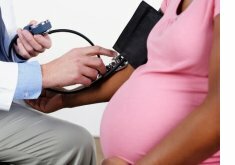 Researchers have developed a method that could help rapidly diagnose pre-eclampsia in pregnant women. They have also uncovered clues that might help explain why women with pre-eclampsia often develop an abnormal amount of protein in the urine, or proteinuria. The findings may lead to better diagnostics and treatments for affected women. Recent studies indicate that pre-eclampsia is linked with the abnormal presence of kidney cells known as podocytes in the urine; however, available tests that can identify podocytes are expensive and time-consuming. In a study of 84 pregnant women, researchers found that a method they developed can rapidly detect fragments of podocytes in the urine of women with pre-eclampsia. They also found that fetal hemoglobin, which is normally present in pregnant women’s blood in small amounts, is present in higher amounts in pre-eclamptic women’s blood. Human cytomegalovirus (CMV) is a common virus found worldwide. When CMV infects fetuses, it can cause serious complications such as hearing difficulties and mental retardation in affected infants. A group of researchers have evaluated for the first time the efficacy of maternal universal screening using CMV IgG avidity tests for congenital CMV infection, and they have also identified issues with the current maternal CMV screening methods. To identify primary CMV infection, maternal blood tests for CMV-specific immunoglobulin (Ig) M antibodies (CMV IgM) are widely used. However, CMV IgM tests can remain positive for years after primary infection, so a positive result for CMV IgM does not always indicate primary infection during pregnancy. A CMV IgG avidity test is also used for identifying a recent infection. This study aimed to determine the effectiveness of CMV IgG avidity tests as a maternal universal screening for congenital CMV infection. The results show that standard maternal screening methods which pinpoint pregnant women who have primary CMV infection during pregnancy can only predict 3 cases with congenital infection, and the remaining 7 cases were overlooked. This year on World Population Day, policymakers, donors and advocates from around the world gathered at the Family Planning Summit in London, UK to discuss efforts to reach our Family Planning 2020 goals and ensure that more women and girls around the world are able to plan their families and their futures. Voluntary family planning saves lives and has the power to boost the development of entire countries. It empowers women and girls to complete their education, create or seize better economic opportunities, and, ultimately, achieve their full potential. Today, there are approximately 214 million women in developing countries who want to time, space, or prevent a pregnancy, but are not using modern contraception. World Breastfeeding Week was celebrated August 1st to 7th, and highlighted the crucial role of breastfeeding in pursuing the Sustainable Development Goals. The World Health Organization recommends that infants be exclusively breastfed for at least the first six months, and mothers continue breastfeeding for two years. WHO aims to increase global exclusive breastfeeding rates to at least 50% by the year 2025. Currently, only 38% of infants around the world are breastfed exclusively, and suboptimal breastfeeding contributes to approximately 800,000 infant deaths annually. Breastfed infants are at least six times more likely to survive in the first few months of life compared to non-breastfed infants. Breast milk helps prevent respiratory infections, diarrheal disease, urinary tract infections, obesity, asthma, diabetes and other life-threatening conditions in children. Furthermore, research suggests that breastfeeding protects mothers against breast and ovarian cancer, reduced bone density and possibly postpartum hemorrhage. Promoting exclusive breastfeeding is particularly important in low-resource settings where maternal and infant mortality and morbidity rates are high. Read more on the ways breastfeeding can help achieve the Sustainable Development Goals.